This article is a part of a series of articles on individuals described in the Vedas, Epics and Puranas, with the name 'Maya' and related concepts like 'Maaya'. Their connection with the Meso American Mayans too is explored in detail. Read the main article:- Danava Maya and Mayans of America. Yakshas were an ancient Indian tribe, similar to the Mayan tribe with a pan-Indian presence. They were present in Tibet, the Himalayas, the Western Mountains (now in Pakistan), Narmada valley and in Southern India. The Yakshas of Tibet, living around mountain Kailasa and Manasarovar controlled the northern trade routes (predecessors of later day Silk routes), where rich mountain goods were traded. Through the sea ports in Dwaraka, Vanga, Southern India and Lanka (Srilanka) they traded these goods to distant lands crossing all the major Oceans. The southern Yakshas controlled the sea-ports in Southern India and Lanka. From the analysis of Valmiki Ramayana, we have already seen the presence of Yakshas in southern India during Ramayana era (reign of Rama and Ravana). There they inhabited the Malaya mountains (southern portion of Western Ghats of India) that lies along Kerala-Tamilnadu, Kerala-Karnataka boarder. We have also explored the possibility of them having their sea port at Kanyakumari, where Malaya mountain terminates at the sea shore of Indian Ocean, close to Mahendragiri. This territory of southern-Yakshas (Dakshina-Yaksha / Ten-Yaksha / Yaksha-Ten / Yaksha-Dakshina) lied to the west of Chola territories and to the immediate west of Maya's cavities / cave networks (Vellore-Selam-Madurai-Kanyakumari). It is interesting to note that there existed a Yaksha territory in Meso America as well, which was considered as a part of the ancient Mayan cultural region in Meso America. There are many territorial entities with names resembling Yaksha, Yaksha-Desa (Yaksha Country), Ten-Yaksha, Yaksha-Ten, Yaksha-Dakshina, Yaksha-Deccan, Yaksha-Tekkan (southern Yaksha) here such as Yucatan one of the 31 states of Mexico and Yucatan Peninsula. These territories are located in South Eastern Mexico along the Atlantic coast. The Yucatán Peninsula comprises a significant proportion of the ancient Maya Lowlands (although the Maya culture extended south of the Yucatán Peninsula, through present Guatemala and into Honduras and highland Chiapas). There are many Maya archaeological sites throughout the peninsula; some of the better-known are Chichen Itza, Tulum and Uxmal. Indigenous Maya and Mestizos of partial Maya descent make up a sizable portion of the region's population, and Mayan languages are widely spoken here. People inhabiting in this region seems to be of a mixed descend that emerged from the Yaksha and Maya tribes who reached here from the ancient sea-ports of southern India, crossing the Oceans in huge ships, following each other. The king of the Yakshas is mentioned as Kubera (Kuvera, Vaishravana) in ancient Indian texts. There were many places mentioned in ancient Indian sub-continent with Kubera's name both in south and north. Thus there were southern Yakshas as well as northern Yakshas, with some tribal kinship existing between them. The place name Khyber, which now appear as the name of a mountain pass in Afganistan-Pakistan boarder is derived from Kubera, the king of the Yakshas. Kubera's presence in Kailasa (mount Kailas, Tibet), Manasa sara (Manasarovar, Tibet) and Himalaya mountains is also well attested in the epics and Puranas. As per Ramayana he ruled at Lanka (Srilanka). When Rakshasa king Ravana rose to power in Lanka (during the reign of Rama), Kubera retreated to his territories in Malaya mountains of southern India (which is wrongly described as Himalaya mountains in Ramayana due to the tribal connections of southern Yakshas and northern Yakshas). Today, Yaksha tribe is known by the name Yakka, Yakha, Yakhu, Yak, Yaka, Yasha etc in Srilanka (ancient Lanka), Nepal (Himalaya) and southern Tibet (Kailasa). Kambojas were an ancient Indian tribe mentioned in Mahabharata and Ramayana and in many Puranas. Their territories were spread in Kashmir, north-West Pakistan and the north and west of it. They were sometimes mentioned as an Asura clan. They have taken part in Kurukshetra War described in Mahabharata, siding with the Kuru king Duryodhana. It is interesting to note that the Khyber pass is named after Yaksha Kubera. In ancient times he controlled the trade goods passing through the trade routes passing through this mountain and earned enormous wealth. Thus he earned the title 'the Lord of the Riches'. Khyber pass falls in ancient Kamboja territories. The Kambojas had trade relations with the Yakshas in Tibet as well as sea ports in Dwaraka, Vanga and southern India (some of which belonged to the southern Yakshas). Naturally if the Mayans and Yakshas who coexisted in India (especially in the sea-faring southern India) we would expect the Kambojas too follow them and reach Meso America. Surprisingly we find them in Campeche another Mexican state bordering Yucatan. Campeche lies to the south west of Yucatan. Even the trade route of the Kambojas to Meso America along Indian Ocean and Pacific Ocean is traceable as a South East Asian country is named after Kamboja, viz. Kampochia / Kambodjia / Camobodia. Kamboja traders from India first settled in Cambodia, giving the land its name and then moved to Meso America where it gave Campeche state of Mexico its name. As per some Western scholars the name of Campeche is derived from the Mayan name of a settlement called “Ah-Kin-Pech” where the city of Campeche is now. The original mean “place of snakes and ticks". This is inaccurate and seems to be a locally derived etymology when the original name 'Kamboja' is lost from memory, a phenomenon not uncommon in many parts of the world as well. The first people to dominate the state were the Mayas, who arrived to Campeche from Guatemala (Ketumala), Honduras and Chiapas. The main Mayan cities were Edzna, Xtampak, and later Calakmul and Becán. The Mayan civilization reached it height between 600 and 900 CE. From 1000 on, the Mayan cities collapsed and were abandoned for unknown reasons. This led to the establishment of smaller settlements and a mixing of the Mayan and Chontal people in the south of the state, which had commercial ties to the central highland cultures of Mexico. From the 11th century to the 16th century, Campeche was divided into smaller dominions. The epics and Puranas describe several vast inhabited continent sized regions called 'Talas'. There are seven Talas identified with what is now known as the seven continents. Among them Rasatala is identifiable with Africa (especially its eastern coast). Patala is identifiable with South America and Meso America. Sutala is identified with Australia (especially its northern western coast) and South East Asia, also known as Suvarna Tala and Suvarna Bhumi (the Golden region). Vitala is the rest of Asia. 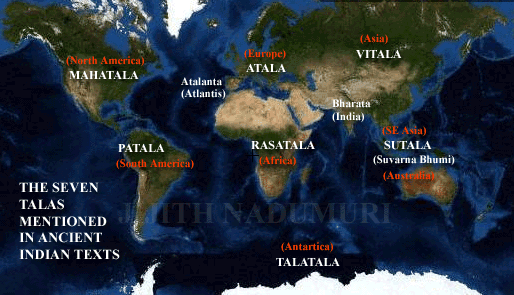 Talatala is identified with Antartica and Mahatala with North America. Atala is identifiable with Europe and Atalanta ('Atala' 'anta', the end of Atala) with the western boundary of Europe including some inhabited islands in Atlantic Ocean. One among such island in Atlantic ocean was inhabited by people with advanced civilization, called Atlantis which as per Greek sources, later submerged. The name of this island called 'Atlantis', the name of 'Atlantic Ocean', the place names like 'Atlanta', the name of Greek god 'Atlas' - all of these are derived from the Sanskrit word 'Atala' denoting a vast region known to ancient Indians which is now known as Europe. Patala is mentioned as a vast region with plenty of precious metals like gold, silver and copper. Ancient Indian sea-traders reached Patala (South America) in search of these. There are places in America where these metals are found in abundance. Argentina (in South America) got its name because of its silver mines. Silver in Sanskrit is called 'Arjuna' (from which its scientific Latin name 'Argentum') is derived. 'Arjuna' means, 'shining white'. There is an island called Copper Island (Kupari-saari)- a local name given to the northern part of the Keweenaw Peninsula (projecting northeastward into Lake Superior at the western end of the Upper Peninsula of Michigan, United States of America. Saari means an island inside a Saras (Lake). Some copper mines in America was in use even in 3000 BCE period (post Mahabharata period in ancient India). There were plenty of gold mines too in both north and south America. There were many kings in ancient India who assumed the title 'Bali' or possessed the tribal name 'Bali' (alternatively pronounced as Vali). Bali means 'the powerful' in Sanskrit. Many kings with the name 'Bali' ruled in the western and eastern coastal regions of India. The territory of Bali kings thus was spread in the coastal region of Indian peninsula. They engaged in sea trade and extended their power into Indian Ocean and into territories lying in Indian Ocean such as South East Asia (Baali) and Eastern Africa. One of the prominent king named Bali was Maha-bali. He was the son of Virochana and grandson of Prahlada and the great grandson of Daitya Hiranyakasipu. He ruled the western sea shore of ancient Indian Sub-continent, from Baluchistan in the north to Kerala in the south. He is still revered as a great king by people of Kerala, in south western India, where every year they celebrate a festival named 'Onam' (Sravanam) to commemorate Mahabali. Subsequent to the expansion of Kashyapa tribe from Kashmir, his tribe later moved to Rasatala (Africa, especially the eastern coast). The territorial names like Bali (a province in Ethiopia in East Africa] and others in Somalia are the result of the presence of the Bali tribe in Rasatala. They later seems to have migrated to the western shores of Africa as well (Bali, Nigeria, Bali city in Cameroon). In Kerala, Onam is celebrated when the Moon is at the star Sravana during the month when Sun is in the constellation of Leo (skt. Simha, mal. Chingam). People of Kerala, Malayalis, celebrate New Year on the day when the sun enters the constellation of Leo following a calender named 'Kolla Varsham'. The current version of this calender started in common era 825 CE (the year of death of the famous sage Sankaracharya / the date when the city Kollam is reopened after it was destroyed due to a natural disaster). However this calendar is the remnant of a much ancient calender established when Vernal Equinox was in the constellation of Leo, around 10,500 BCE to 8000 BCE. Almost all of the ancient cultures design their calenders such that they start their years with Vernal Equinox when day and nights will be equal in duration so that it is easy to mark the beginning of the year. But the Vernal Equinox shift from constellation to constellation due to Precession of Earth's axis which take 25,772 years to complete one revolution, traversing 1 degree in around 72 years, and one constellation (30 degrees) in around 2148 years. Around 10,500 BCE is also the period arrived at by Graham Hancock and Robert Bauval as the date when the Great Pyramid and the Sphinx were constructed in Egypt. Since I identify Rasatala with east coast of Africa, it follows that the civilization that created these structures could be belonging to the Asura Daitya tribe of Mahabali (his predecessors or successors). Africa (including Egypt) also falls midway to Patala (identified with South America and Meso America) which was the final destination of Mahabali as per the Onam myth. As per this myth Mahabali was sent to Rasatala and Patala by a Kasyapa sage named Vamana who famously measured the Earth in three strides (an allusion to the cartographic measurement of the surface of Earth marking its longitude and latitude). Kerala has yet another calender with New Year (named Vishu, Vaishakhi) celebrated on the day when sun is in the middle of constellation of Aries (skt. Mesha, mal. Medam) around April 15. This calender is the remnant of another ancient calender system when Vernal Equinox was in the middle of constellation of Aries (corresponding to 3100 BCE). Modern Western Astrology which which considers Aries as the first constellation, originated in 2150 BCE in Greece. India's national calender, (current version:- Saka Era which started at 78 CE) too consider Aries as the first constellation of the year. It is speculated that Vanara Baali (Vaali) mentioned in Valmiki Ramayana as the brother of Vanara Sugriva is a member of the Bali tribe. Baali is mentioned as the son of Indra. As per my analysis Indras are many who ruled as kings at various time at various places, belonging to various tribe. A king of the Sivi kingdom is mentioned as one among the many Indras. Mahabali is also considered as one among the many Indras. Hence Baali could as well be a descendant or son of Mahabali. Another king Bali is mentioned as ruling in Bihar, Bengal, Orissa region as per Mahabharata. His descendants were mentioned as the founders of the five famous kingdoms of ancient India:- Anga (in Bihar), Vanga (in west Bengal), Kalinga (in Orissa), Pundra (in Bangladesh) and Suhma (in Bangladesh). The descendants of this Bali have moved to South East Asia using sea ports of Vanga and Kalinga. The Indonesian island Bali bears the name of ancient territories of Bali in SE Asia. The Bali tribe seems to have also reached China attested by the names like Bali in China. Following other tribes like the Mayas, the Nagas, the Yakshas, the Balis too reached Meso America. Their territory became later known as Belize. To the south of it was Ketumala (Gautemala) a prominent geographical territory described in the epics and Puranas of ancient India which describe the geography of the whole world known to ancient Indians. The etymology of the name Belize using the native Maya word belix, meaning "muddy water" is purely artificial and a later invention. Belize has a sizeable proportion of Africans from the ancient Kingdom of Kongo, who could have brought the name with them, as there is a Belize in Angola as well. This indicate it was the Bali tribe of western India who came by circumventing the Eastern and Western coast of Africa and crossing the Atlantic Ocean, who dominated Belize rather than the Eastern Bali who came by SE Asia and the Pacific Ocean. Among the Incas (another ancient civilization in Americas besides Mayan) in the west coast of South America there is a god by the name Viracocha who is none other than Asura Virochana, the father of king Mahabali. Viracocha is the great creator god in the pre-Inca and Inca mythology. See:- Virochana in Atharva Veda, Virochana in Ramayana, Virochana in Mahabharata, Virochana in Vishnu Purana. In Sanskrit the name 'Virochana' means 'the bright one', 'the shining one', 'illuminating one', 'light', luster' etc. This name is used to denote sun, moon and fire. It is also used as the name of sun-god. Virochana is also the fifth in descend from Pitamaha Brahma (Spitama in Avesta):- Brahma - 1.Daksha - 2.Diti - 3.Hiranyakasipu - 4.Prahrada - 5.Virochana and thus is the Fifth Sun. Thus Virochana was a contemporary of Zara-tushtra, who is mentioned as fifth in descent from Spitama as per Avesta. Viracocha was one of the most important deities in the Inca pantheon and seen as the creator of all things, or the substance from which all things are created, and intimately associated with the sea. This is because Virochana reached South America from India crossing the Indian Ocean and Pacific Ocean. Viracocha created the universe, sun, moon and stars, time (by commanding the sun to move over the sky) and civilization itself. Viracocha was worshipped as god of the sun and of storms. He was represented as wearing the sun for a crown, with thunderbolts in his hands, and tears descending from his eyes as rain. He wandered the earth disguised as a beggar, teaching his new creations the basics of civilization, as well as working numerous miracles. He wept when he saw the plight of the creatures he had created. This indicate the huge effort Virochana had to make to establish a civilization in South America. Viracocha was described as "a man of medium height (in some narrations, tall), white and dressed in a white robe like an alb secured round the waist, and that he carried a staff and a book in his hands". Spanish chroniclers from the 16th century claimed that when the conquistadors led by Francisco Pizarro first encountered the Incas they were greeted as Gods, "Viracochas", because their lighter skin resembled their God Viracocha. It is possible that Virochana indeed had a lighter skin color since he belonged to Asura Daitya tribe. But the "whiteness" here need not be mere skin color but could as well represent Virochana's role as a sun-god, who was often hailed as 'the bright one', 'the shining one', 'illuminating one', 'light', luster' etc. In one legend he had one son, Inti, and two daughters, Mama Quilla and Pachamama. In this legend, he destroyed the people around Lake Titicaca with a Great Flood called Unu Pachakuti, saving two to bring civilization to the rest of the world, these two beings are Manco Cápac, the son of Inti (sometimes taken as the son of Viracocha), which name means "splendid foundation", and Mama Ocllo, which means "mother fertility". These two founded the Inca civilization carrying a golden staff, called ‘tapac-yauri’. In another legend, he fathered the first eight civilized human beings. In some stories, he has a wife called Mama Cocha. In another legend, Viracocha had two sons, Imahmana Viracocha and Tocapo Virachocha. After the Great Flood and the Creation, Viracocha sent his sons to visit the tribes to the Northeast and Northwest to determine if they still obeyed his commandments. Viracocha himself traveled North. During their journey, Imaymana and Tocapo gave names to all the trees, flowers, fruits and herbs. They also taught the tribes which of these were edible, which had medicinal properties, and which were poisonous. Thus it is clear that Virochana's children spread the Inca civilization in South America. Eventually, Viracocha, Tocapo and Imahmana arrived at Cuzco (in modern day Peru) and the Pacific seacoast where they walked across the water until they disappeared. It seems Virochana and his son sailed back to India. In Kerala, as per Onam myth, a great king and leader of the people (viz. Asura Mahabhali, the son of Virochana) leaves his south western Indian coastal territory and goes to Rasatala and Patala. As if complementing this myth we have in South America and Meso America the myth of Viracocha arriving there from a far away land beyond the oceans and becoming their king / leader of people / god / builder of civilization. The Kerala myth also states that Mahabali will rule at Rasatala and Patala (identified as Africa and Americas respectively) like Indra as a great ruler and we see that was exactly Viracocha did in the Americas. Thus it is possible that Viracocha of the Americas was none other than 'Asura Mahabali Virochana Putra' (Asura Mahabali, the son of Virochana) which got abbreviated as Viracocha. There is also evidence for Mahabali's intermediate presence in Africa (Rasatala) in the Egyptian myth of Osiris. The Egyptian god Osiris is mentioned as the main god who brought civilization to Egypt from a far away land beyond the eastern shore / eastern ocean from a south eastern direction. The name 'Osiris' could be an abbreviation of the name 'Asura' the tribal appellation of Mahabali. Ketumala is a geographical region mentioned extensively in Mahabharata and Vishnu Purana as an important region in the world known to ancient Indians. It is mentioned as a western region (indicative of America). It is mentioned as among the four continental regions known to ancient Indians as inhabited by people like them:- Bhadraswa (South East Asia), Ketumala (Americas), Jamvudwipa (Indian Sub-Continent), and Uttar-Kuru (Rest of Asia to the north of India). The remnant of the name Ketumala as applied to America is seen in the name Guatemala, a Meso American country, which was part of the Mayan cultural region. As per Western historians the origin of the name "Guatemala" is unclear, but several theories exist. "Guatemala" is derived from "Goathemala," which means "the land of the trees" in the Maya-Toltec language. Another theory is that it comes from the Nahuatl expression "Cuauhtitlan," meaning "between the trees". All of these etymologies are incorrect and pales in comparison to the etymology derived from the Sanskrit territorial name Ketumala, applied to the Americas. Uraga is an ancient Naga (snake worshiping) tribe mentioned in Mahabharata and other ancient Indian texts. There presence in Kashmir (with place names like Uri) and in Southern India is well attested in these texts. They were a sea-faring tribe like many Naga tribes. Their presence in South America is attested by the name of the country Uruguay. Gaya was another Asura tribe mentioned in ancient Indian scriptures. An Asura by the name Gayasura belonging to this tribe is mentioned as ruling from a territory in what is now Bihar state of India. Currently the place name Gaya is a remnant of this territory. The Gaya-Asura tribe seems to have reached South America forming two kingdoms one (Gaya) in the east of South America and other to its west (Apara Gaya). The name of two countries Guyana and Paraguay bears the name of ancient Gaya and Apara-Gaya (meaning the other Gaya or the western Gaya) in South America. Guyana is the ancient Gaya of America and Paraguay is the ancient Apara Gaya of America. Gautemala (Ketumala) mentioned in Mahabharata - It says:- "On the western side of Meru is Ketumala;" - Here Meru is a term used to denote axis of Earth or the 'reference Meridian' like the Greenwich Meridian. Guatemala (Ketumala) mentioned in Vishnu Purana] - It says:- "The countries of Bharata, Ketumala, Bhadraswa, and Uttarakuru lie, like leaves of the lotus of the world"